I don't mean to scare anyone, but it appears that this website - and many others around the Internet - have been recently used (and continue to be used) by international criminals to post information related to banking and credit card fraud. Some of the messages appear to be encrypted, some not. They may or may not be being placed online by "bots" but I STRONGLY suggest that ALL readers run up-to-date anti-virus routines on their pc's NOW. I have NO reason to believe that the operator of this website is behind or otherwise responsible for this activity; in fact he has promptly removed offending posts as soon as he's been made aware of them. 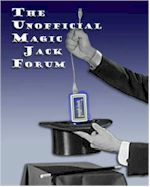 NOR do I have ANY reason to believe that the MagicJack company itself is responsible. Please know that when I called a major international banking concern's fraud control department to report this matter, the fraud department's phone que was UNUSUALLY long and one of the questions I was asked was "Do you use MagicJack?" Readers should draw their own conclusions from this information but be EXTRA vigilant when it comes to the privacy and security of their personal credit card and banking information. Check your accounts for fraudulent activity FREQUENTLY and report it to your banking institution as soon as you notice any such activity. A good and complete Anti Virus/spyware software and a dependable router at home is greatly recommended before surfing online. Most especially if you do online transactions too often. The posts - at least on this website - appear to have stopped, and this site's administrator has taken down those that had been posted (possibly posted via bots, who knows). I didn't mean to imply that there as anything on THIS site that could compromise readers' security *directly* though.